2017 has just started but some longer-term trend changes already seem to develop. It is interesting how a new year combined with a new US president act as a catalyst for what will be the start of monumental events in the world economy. Not that many of these will come as a surprise to the readers of my articles but for the rest of the world, there will be one shock after the next which will create real panic. We are now seeing the beginning of reversals in many markets. Some of these new trends will take longer to develop and some could happen surprisingly quickly. Most major markets will be affected namely: Bond & Credit Markets, Currencies, Stocks, Metals, Precious Metals Mining stocks and Property. 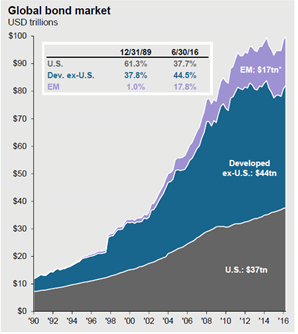 Let’s first look at the biggest bubble of all bubbles ever in history – the Global Bond Market. This is a market which has virtually exploded from $10 trillion in 1990 to $100 trillion today. And if we look at the debt expansion in the last 10 years since the Great Financial crisis started in 2006, the global bond market has gone up by 70%. With the 10 times increase in the global bond market since 1990, you would have expected to see a major expansion of global GDP. But this is far from the case. World GDP has gone from $20 trillion in 1990 to $74 trillion today. This is an increase of only 3.7X. For every $1 increase in GDP, the world has had to issue 2.7X as many bonds. That is what is called the law of diminishing returns. More and more debt is required to expand the global economy. Sovereign bonds are over 50% of this market and it is governments worldwide that have been the most profligate in creating debt. No government will ever be in a position to repay this debt with real money. The problem they now have is that they can’t even afford to service the debt. This is why around $15 trillion of government bonds now carry negative interest rates. 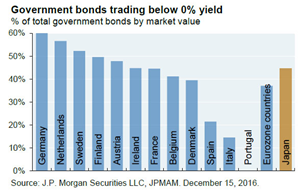 This includes over 50% of the bonds issued by Germany, Netherlands, Sweden and Finland. In Switzerland, virtually all government bonds are below 0%. (not shown). So we are seeing a global debt explosion combined with zero or negative interest rates. In a free market, this could never happen. If there was no intervention, record borrowings would lead to very high interest rates. A high demand for a commodity, like money, would in accordance with the laws of supply and demand lead to a high cost. Thus, what we are seeing currently is the effect of financial repression or manipulation of the interest markets, like with all other financial markets. This of course cannot hold. Therefore, the turn in the bond market which is now starting will cause the biggest collapse in world financial markets ever! In July 2016, the 10 year US Treasury reached 1.33% which is the lowest ever recorded and below the 1945 low. 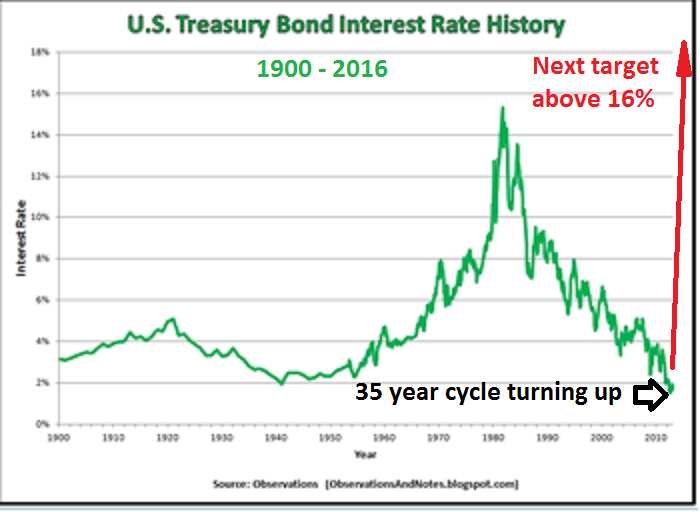 The 35-year secular rise of US rates went from just under 2% in 1945 to 16% in 1981. In 1970, just before Nixon abandoned the gold standard, the rate was 6.5% and in the next eleven years, high inflation and a dollar that halved in value led to a collapse of US treasuries. During certain periods, rates moved up very quickly and between June 1980 and October 1981 for example the US 10-year went from 9.5% to 16%. I would not be surprised to see a similar magnitude of a rise starting in 2017. Eventually the 10 year is likely to reach well above the 1981 level of 16%. This would of course involve a total breakdown of the US bond market as well as most global debt markets. A collapse of US bonds would not just cause panic in global bond markets but also in currency markets. Just as the bond market has turned down (yields up), it seems that the US dollar has now topped and will continue its long-term downtrend. The US dollar index below shows that the new correction high of the dollar is not confirmed by the technical indicators. The dollar against the Euro shows a similar picture. For anyone under the illusion that the dollar is a strong currency, just look at the chart below of the US$ against the Swiss Franc. 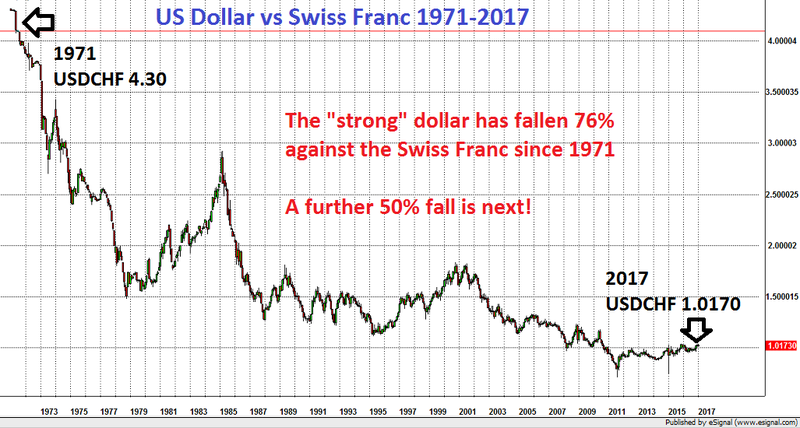 During my working life, I have seen the dollar fall 76% against the Swissy. Hardly the sign of a strong currency. 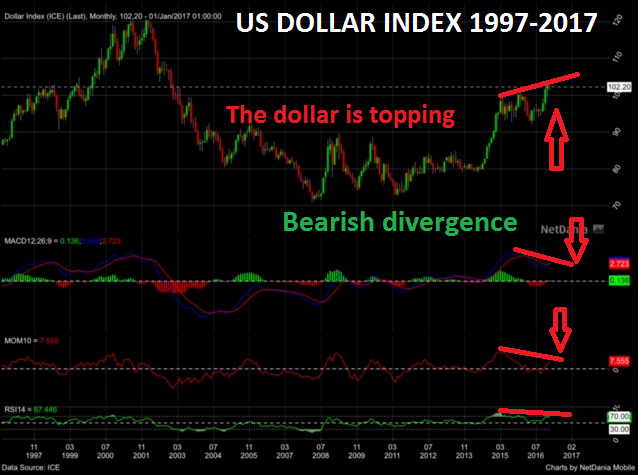 It now looks like the next leg down of the dollar is imminent. Against the Swissy, I would expect another 50% fall of the dollar to 0.50. That doesn’t mean that I believe that the Swiss Franc will be a strong currency. But I do see a collapse of the US dollar until it reaches its intrinsic value of ZERO or just above. The weak dollar shows the total mismanagement of the US economy and thus of the US currency. With total debts in excess of $ ¼ of a quadrillion including unfunded liabilities, there is only one direction the dollar can go. Currently the dollar is massively overvalued due to its reserve and petro currency status. The main reason for the dollar demand has been it use as the currency for all global oil transactions. Although this is now only changing slowly, it is likely to accelerate in 2017 and onwards. Once the yuan, ruble, euro and gold assume the role of the dollar as the preferred payment for oil, the reserve currency status of the dollar is finished. So it looks like the dollar will lead the race to the bottom of all the currencies. No currency will fall in a straight line and they will all take turns in this race. What holders of dollars and other currencies must remember is that governments and central banks will be under tremendous pressure during a simultaneous fall of credit markets and currency markets. Because both these events will lead to a massive pressure on the financial system and especially the banks. Governments will need to take draconian measures in their futile attempt to save the banks. It will be impossible to take any money out except for very small spending money and even that might not be available. It will be mandatory to invest the major part of deposits and any other assets in your bank account in government bonds that must be kept for an undetermined period. At the same time, as most bank assets will be frozen, there will be very strict exchange controls. This will make it totally impossible to transfer any funds out of the country except for some commercial transactions. There is therefore probably not much time left for investors to put their house in order and take the necessary wealth protection measures. This involves holding physical gold and silver in the safest jurisdictions outside your country of residence and outside the banking system. Bitcoin has benefitted from the current fear in financial markets and has risen 100% since January 2016. But it is a volatile market and in the last few days we have seen a 33% fall. It is likely that Bitcoin will continue to rise since many investors believe that this is the best way to avoid any currency restrictions, regulations, bank failures or confiscation. But investors must remember that Bitcoin has nothing to do with wealth preservation. Bitcoin is an electronic currency not dissimilar from paper money. Bitcoin, like paper money, has zero intrinsic value. Also, the risks are manifold. Bitcoins can disappear without trace. And if something happens to the internet, like temporary shutdown or cyber-attacks, investors will have a problem using their Bitcoins. But I see the biggest problem being government regulations. If Bitcoin and other cyber currencies are too successful, governments will start regulating that market until it becomes just another paper currency. 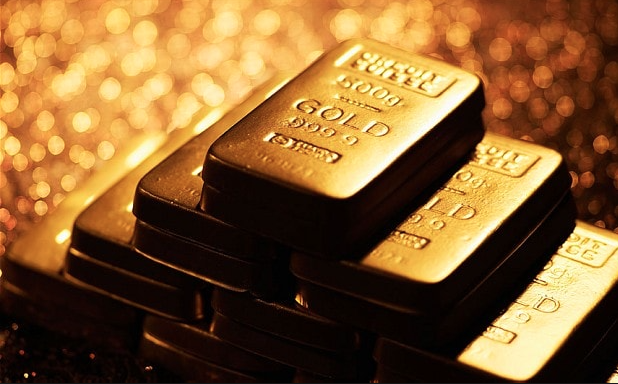 I still don’t see a better form of wealth preservation than precious metals. Gold in many currencies bottomed in 2013. In dollars, gold bottomed at the end of 2015. We saw a strong move up until mid-2016 and since then both gold and silver have corrected down. It looks like this correction has now finished and the clearest indication is given by the HUI or Gold Bugs Index. Since December 19, 2016, the HUI is already up 27% and it is also up 27% against the Dow since December. HUI will continue to vastly outperform all other stocks globally. Gold is only up 7% in US$ since the correction low on December 15. Whether gold (and silver) lingers at these levels for a bit longer or if they move up quickly from here is irrelevant. Because 2017 will see a major move up in the whole precious metals complex which is likely to be spectacular. Potentially we could see new highs in gold and silver in 2017. Tagged Bitcoin, Bond market bubble.